The emergence of REDD+ has generated great interest as a possible means of increasing support for the forest stewardship activities of indigenous peoples and local communities. If done well, REDD+ initiatives could strengthen community land and resource rights, empower community institutions and increase income through benefit sharing. Yet, REDD+ has also sparked concerns about possible adverse impacts on indigenous and community rights and livelihoods, such as restrictions on land and resource rights, increased centralization of forest management and inequitable benefit-sharing. WWF believes that REDD+ is a key to effective climate change mitigation but needs to integrate strong social and environmental safeguards. 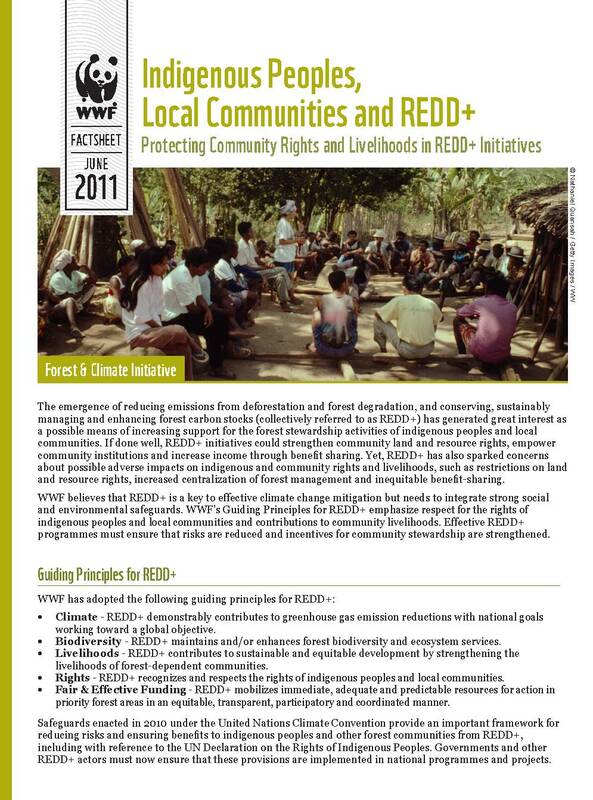 WWF’s Guiding Principles for REDD+ emphasize respect for the rights of indigenous peoples and local communities and contributions to community livelihoods. Effective REDD+ programmes must ensure that risks are reduced and incentives for community stewardship are strengthened.